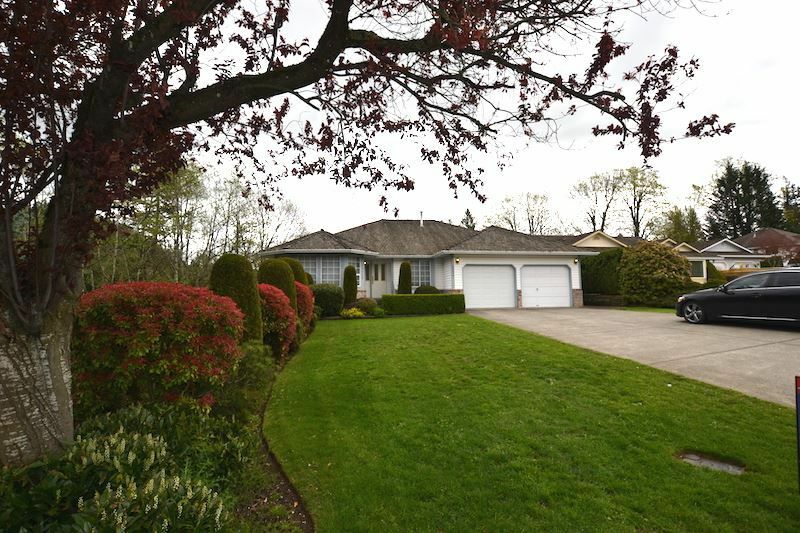 East Abbotsford Rancher w/ full walkout basement. PLUS a paved RV parking pad with power. Solid clean nice level entry home that was custom built for the original owner. Updated Kitchen has lots of cabinets, granite counter tops, huge bright eating area & opens to the familyrm & a large sundeck & Phantom screens. Formal front room is great for entertaining. Front entrance bedroom now office with built in desks. Huge master bedroom with new ensuite, double sinks. Laundry room is on main floor off the dble garage. 3 bedrooms on main floor. Basemnt partly finished with 2 more bedrooms, full bathroom, huge L shaped games & family room with 2nd F.P. & phantom screen, patio doors to a large backyard. Basement is easily suited if needed, Great location easy freeway commute, shopping and walking.